A closed sign is posted on the gate of Smithsonian's National Zoo, Wednesday, Jan. 2, 2019, in Washington. Smithsonian's National Zoo is closed due to the partial government shutdown. "The Shutdown is only because of the 2020 Presidential Election," Trump claimed Thursday in a Twitter comment. "The Democrats know they can't win based on all of the achievements of 'Trump,' so they are going all out on the desperately needed Wall and Border Security - and Presidential Harassment. For them, strictly politics!" Trump is demanding more than $5 billion to build a wall along the U.S.-Mexican border as part of the deal to reopen the government, telling opposition Democratic leaders on Wednesday he "would look foolish" to cave in on his signature 2016 campaign pledge to erect the barrier to thwart illegal immigration. 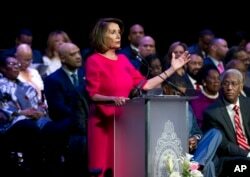 House Minority Leader Nancy Pelosi, D-Calif., speaks during Congressional Black Caucus members swearing-in ceremony of the 116th Congress at The Warner Theatre in Washington, Thursday, Jan. 3, 2019. But Nancy Pelosi, set to take over as House speaker when Democrats assume control of the House of Representatives on Thursday, said Democrats would give "nothing for the wall," aside from their offer for $1.3 billion for improved border security. "Could be a long time, or it could be quickly," Trump said. But he said the border wall is "too important a subject to walk away from." He said he would keep the shutdown going "as long as it takes" to secure funding for the barrier. One of his staunchest congressional allies, Republican Senator Lindsey Graham, said it would be "the end of his presidency" if Trump were to give up on construction of the wall. At a Cabinet meeting Wednesday, Trump contended that "walls work," and called the border with Mexico a "sieve." "We're talking about national security. This isn't just a border, this is national security," Trump said. "This is health and wellness. This is everything." The president used Twitter late Wednesday to again say he is willing to work with Democrats on a bill that would secure U.S. borders. Hours later he followed with another post, declaring, "Sadly, there can be no REAL Border Security without the Wall!" Senate Minority Leader Chuck Schumer said after Wednesday's meeting he had asked Trump to provide "one good reason" why the shutdown should continue, and that Trump "could not give a good answer." House Republican Leader Kevin McCarthy told reporters he thinks it is possible lawmakers and the president can agree on a resolution "rather quickly." "We know we have a challenge along the border. We want to solve that issue," McCarthy said. "We want to make sure we open this government up. And I think at the end of the day, the president, listening to him, he wants to solve this, as well." "That is so ridiculous. A, Mexico's not paying for it. And B, we have better use of funds to protect our border. The president knows that," Pelosi said.